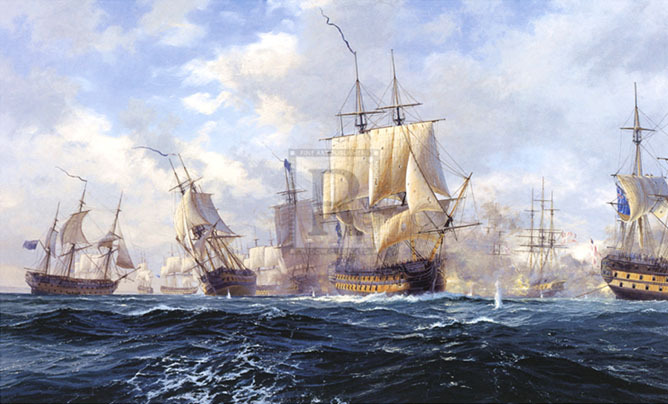 A set of spectacular depictions of four great 19th Century sea battles by the highly-regarded maritime artist Steven Dews. 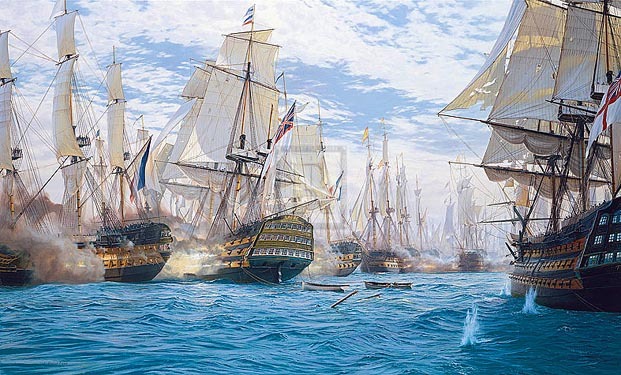 Large-scale prints on canvas of The Battle of Trafalgar, the Battle of Copenhagen, USS Constitution v. HMS Java, and The Battle of the Chesapeake. Each print is accompanied by a Certificate of Authenticity signed by the artist Steven Dews and is printed with lightfast inks onto fine archival-quality cotton canvas, coated with acid-free priming for permanent artwork reproduction. Confirmation of his pre-eminence came in the Sotheby’s sale of Maritime Art in London in 1999, where his original, entitled Off Cowes, sold for the phenomenal price of £89,500 ($165,000). This result followed on quickly from the sale at auction in 1998 of the Steven Dews painting An Opportune Breeze from the South East for £52,800. In September 2012, his record price was broken again when the painting Battle of Trafalgar sold at Bonhams in London for £170,000.